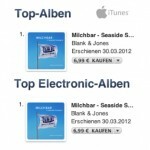 Milchbar Seaside Season 4 hits the German iTunes charts at no.1! Blank & Jones are celebrating the first no.1 on the german itunes album charts. This compilation feat. brillant artists like Chicane, Bliss, Afterlife and many more. Also some new Blank & Jones tracks and remixes are included a fantastic Afterlife Remix of the Blank & Jones song Coming Home and a exclusive Blank & Jones Remix of Sinan Mercenk’s track He Say. Check out the complete Milchbar 4 Tracklist including a brand new Blank & Jones track Sonnenuntergang, with a vocal sample of germanys most famous actor Til Schweiger.